Science fiction was my first literary love. As a pre-teen I devoured Asimov, Clarke, Heinlein, and others, without thinking too much about genre labels. In retrospect, my favorites were allegorical fantasies – the science was secondary. What I’d now consider “real” sci-fi has its own label: “hard science fiction.” This subgenre is concerned with scientific accuracy in a fictional context. With that out of the way, Andy Weir’s The Martian is a smashing “hard science fiction” novel (fans at NASA invited Weir to visit.) Don’t let this turn you off – if the Apollo 13 story brings you to the edge of your seat and you cry every time, even though you know what’s going to happen (fine if you don’t cry, but what’s wrong with you? ), you should love this book. 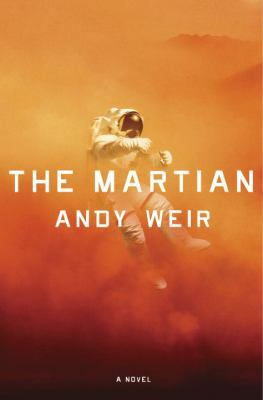 Weir self-published The Martian as a serial on his website starting in 2009. In 2011, he published the novel as a Kindle Single (eBook), for the minimum price (99 cents). Amazon’s sales numbers caught the attention of Crown Publishing, which released an edited version in 2014 (this is the one to get.) The Martian is currently being developed as a movie by Ridley Scott, starring Matt Damon. It’s about an astronaut who becomes stranded on Mars, and how he survives. That’s it. The science feels right to me, although I can’t verify much. But there are no convenient “hyperdrive repairs” used as plot devices – the situation is clear from the outset, much goes wrong, and every solution makes sense. Along the way, Weir provides plenty of humor (his protagonist is a wiseass); the nail-biting finale is well-told and hard-earned. And yes, I cried. Weir doesn’t spend too much time on philosophical questions, although they occur to the reader. One of these is addressed directly, namely the effort and cost humans will expend to rescue someone who is in trouble. We do this all the time – soldiers, hikers, miners, astronauts. When the situation falls apart, we pull together. Weir concludes that most humans want to help one another, even if a few won’t – the majority of us are OK. But I keep thinking… We’re all about the expensive rescue, but we don’t seem to have as much interest in helping those who face everyday disasters, like poverty – those who work two or three jobs and still can’t make ends meet, the ones who turn to crime or other unsavory options to provide for themselves. Become stranded, or fall down a well, and humanity has your back. Just don’t commit the sin of being poor, or unlucky. Another thing The Martian makes absolutely clear is that human survival requires measurable resources – if those aren’t available, we die. Extrapolate the “measurable resources” concept to life on earth, and you might wonder about the idiocy of McMansions or Hummers… We might all become Martians before too long – why aren’t we doing more to conserve resources now? Sigh. Don’t let the above diversions keep you from enjoying this outstanding novel. But if you happen to start thinking any of these thoughts, feel free to give me a call. The Martian is in the tradition of the best sci-fi: it works on its own, and it makes you think.